40 minutes (10 tracks) of secular Christmas tunes arranged for Jazz Orchestra. 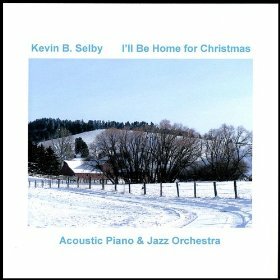 You’ll hear acoustic piano, jazz trap set, upright bass, breathy saxophone, vibraphone, jazz guitar, and strings gently bringing back those old favorites like “Let it Snow”, “White Christmas”, and others. The gorgeous cover art picture was graciously provided by Jane Loughney, a local Washington state photographer. You can view her work at: http://www.janeloughneyphotography.com/Home.html. Many many thanks to Ms. Loughney!! Slow, almost wistful rendition of this classic Christmas song. For many folks out there, Christmas time can be lonely. I am hoping that this arrangement will draw families closer together such that they think of each other during the holiday season even if they cannot be together. This song is meant to be happy and playful and therefore I arranged it that way. Straight-ahead arrangement with acoustic piano, upright bass, trap set, vibes and jazz guitar. My hope is that this track puts a pep in your step all through the holiday season! Slow, moody, smooth arrangement of this gorgeous tune. Clean, upbeat arrangement of this Christmas tune. I was trying to achieve a bell-type tinkly sound that would echo the main melody. Gorgeous lullaby arrangement of this wonderful Christmas tune. This is hands down my favorite track on the album. At first my wife didn’t like this arrangement at ALL, but I assured her that it would grow on her and now she likes it (and that’s a GOOD thing). Slow, smooth sultry rendition of this timeless classic. My musician friends and I found it amusing that some of the lower sax notes sound like a tugboat going out to sea. I left them in there because I thought they sounded cool! Straight-ahead rendition of this Christmas tune. I had the HARDEST time getting good timing with the ride cymbal on this track. I finally trashed all the ride cymbal work and redid it from scratch until I was happy with it. Straight-ahead, sometimes double-time arrangement of this Christmas tune. Listen for the flute melody halfway through. Reminds me of a little blue bird singing along happy as a lark (but then he wouldn’t be a blue bird anymore would he?). Undoubtedly the most complicated tune on the entire album. You would not BELIEVE how many chord changes are in this tune. I almost left this track off the album because I wasn’t sure I could do it justice, but I hung in there and with some cheering from my greatest fan, I managed to finish it. Slow and meaningful arrangement of this gorgeous tune. Nylon acoustic guitar takes the melody. This song is dedicated to Kris Marston since she loves this song so much. I hope I arranged it to her liking.